Veronica's veil, painting by Domenico Fetti (c. 1620). 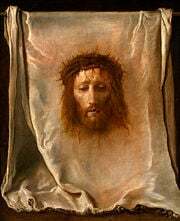 The Veil of Veronica, known in Italian as the Volto Santo or Holy Face, is a Roman Catholic relic, which, according to legend, bears the likeness of the Face of Jesus that was imprinted on it prior to Jesus' crucifixion. According to Roman Catholicism, Saint Veronica encountered Jesus in Jerusalem on the way to Calvary. When she paused to wipe the sweat (Latin, suda) off his face with her veil, his image was allegedly imprinted on the cloth. (In Latin, the veil is known as the Sudarium meaning "sweat-cloth"). It is said that Veronica later traveled to Rome to present the cloth to the Roman Emperor Tiberius and the veil possesses miraculous properties, being able to quench thirst, cure blindness, and sometimes even raise the dead. St Veronica offering Jesus the veil, from a series of Stations of the Cross. The story, however, is not found in the Bible and does not appear in its present form until the Middle Ages. For this reason, it is unlikely to be historical. Rather, its origins are more likely to be found in image of Jesus associated with the Eastern Church known as the Mandylion, coupled with the desire of the faithful be able to see the face of their Redeemer. Nevertheless, during the fourteenth century, the Veil of Veronica became a central icon in the Roman Catholic Church, which attracted thousands of pilgrims. It continues to play an important role in Catholic lore and veneration. For example, the event is commemorated by one of the Stations of the Cross. In addition, the Veil of Veronica constitutes a special type of icon in Christianity called an "Acheiropoieta," which means that it was allegedly not made by human hands. 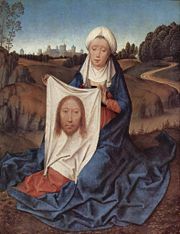 The legend of the Veil of Veronica tells how Saint Veronica encountered Jesus in Jerusalem on the way to Calvary. She wiped the sweat off his face with her veil and the image of his face was allegedly imprinted on the cloth. However, there is no reference to the story of Veronica and her veil in the canonical Gospels. The closest is the miracle of the woman who was healed by touching the hem of Jesus’ garment (Luke (8:43-48); her name is later identified as Veronica by the apocryphal "Acts of Pilate." The story was later elaborated in the eleventh century by adding that that Christ gave her a portrait of himself on a cloth, with which she later cured Tiberius. The linking of this with the bearing of the cross in the Passion, and the miraculous appearance of the image was made by Roger d'Argenteuil's Bible in French in the thirteenth century, and gained further popularity following the internationally popular work, Meditations on the life of Christ of about 1300, by a Pseudo-Bonaventuran author. It is also at this point that other depictions of the image change to include a crown of thorns, blood, and the expression of a man in pain. 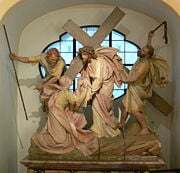 The image became very common throughout Catholic Europe, forming part of the Arma Christi, and with the meeting of Jesus and Veronica becoming one of the Stations of the Cross. On the Via Dolorosa in Jerusalem there is a small chapel, known as the Chapel of the Holy Face. Traditionally, this is regarded as the home of St Veronica and site of the miracle. The name "Veronica" is a colloquial portmanteau of the Latin word Vera, meaning truth, and Greek Icon, meaning "image;" the Veil of Veronica was therefore largely regarded in medieval times as "the true image," and the truthful representation of Jesus, preceding the Shroud of Turin. It has often been assumed that the Veronica was present in the old St Peter's in the papacy of John VII (705-708 C.E.) as the chapel known as the Veronica chapel was built during his reign, and this seems to have been the assumption of later writers. However, mosaics that decorated that chapel do not refer to the Veronica story in any way. Furthermore, contemporaneous writers make no reference to the Veil in this period. It would appear, however, that the Veronica was in place by 1011 C.E. when a scribe was identified as keeper of the cloth. When the Sack of Rome occurred in 1527, some writers recorded that the veil had been destroyed: Messer Unbano to the Duchess of Urbino say that the Veronica was stolen and passed around the taverns of Rome. Other writers testify to its continuing presence in the Vatican: One witness to the sacking says that the Veronica was not found by the looters. Many artists of the time created reproductions of the Veil, but in 1616, Pope Paul V prohibited the manufacture of copies of Veronica's Veil unless made by a canon of Saint Peter's Basilica. In 1629, Pope Urban VIII not only prohibited reproductions of Veronica's veil from being made, but also ordered the destruction of all existing copies. His edict declared that anyone who had access to a copy must bring it to the Vatican, under penalty of excommunication. After that time, the Veil disappears almost entirely from public view, and its history following that date is unrecorded. The possibility exists that the relic remains in St Peter's to this day; this would be consistent with such limited information as the Vatican has provided in recent centuries. Very few inspections have been recorded in modern times. In 1907, Jesuit art historian Joseph Wilpert was allowed to remove two plates of glass to inspect the image. He commented that he saw only "a square piece of light colored material, somewhat faded through age, which bear two faint rust-brown stains, connected one to the other." In 2011, Australian film scientist Vincent Ruello claimed to have shown that the Veronica Veil from St Peters is authentic. 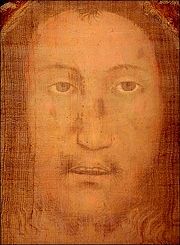 Through a process of 3D negative filming that he previously used on the Shroud of Turin, the injured face of Christ was revealed. There are at least six images in existence that bear a marked resemblance to each other and which are claimed to be the original Veil, a direct copy of it or, in two cases, the Cloth of Edessa. Each member of this group is enclosed in an elaborate outer frame with a gilded metal sheet (or riza in Russian) within, in which is cut an aperture where the face appears; at the lower extreme of the face there are three points which correspond to the shape of the hair and beard. 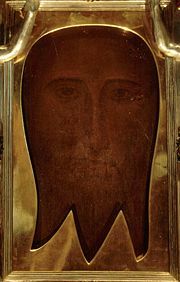 The Holy Face of Vienna. The Holy Face of Alicante. The Holy Face of Jaén. There is certainly an image kept in St Peter’s Basilica that purports to be the same Veil of Veronica as was revered in the Middle Ages. This image is stored in the chapel that lies behind the balcony in the south west pier which supports the dome. The face is still displayed each year on the occasion of the 5th Sunday of Lent, Passion Sunday. The blessing takes place after the traditional Vespers at 5:00 p.m. There is a short procession within the basilica, accompanied by the Roman litany. A bell rings and three canons carry the heavy frame out on the balcony above the statue of St. Veronica holding the veil. From this limited view, no image is discernible and it is only possible to see the shape of the inner frame. This is an important copy of the Veronica, identified by the signature of P. Strozzi in the right hand corner of the inner frame. He was the secretary of Pope Paul V, and a man referred to by Vatican notary Jacopo Grimaldi as making a series of six meticulous copies of the veil in 1617. The outside of the frame is relatively modern, while the inner frame is roughly made and corresponds to the cut-out pattern of earlier copies. The face within is very unclear, more a series of blotches in which only the bare elements of a nose, eyes and mouth can be identified. This argues for the authenticity of the copy as there is clearly no attempt at artistic enhancement. Furthermore, the fact of its being copied from the Vatican copy after the Sack of Rome in 1527 suggests that the original image may have survived that event. It is kept in the Schatzkammer of Sacred and Secular Treasurers of the Habsburg dynasty in the Hofburg Palace, Vienna. This relic was acquired by Pope Nicholas V from relatives of the Byzantium Emperor in 1453. This veil was given by a Vatican cardinal to a Spanish priest, Mosen Pedro Mena, who took it to Alicante, in southern Spain, where it arrived in 1489, at the same time as a severe drought. Carried in a procession on March 17, by an Alicante priest, Father Villafranca, a tear sprang from the eye of the face of Christ on the veil and rain began to fall. The relic is now housed in the Monastery of the Holy Face (Monasterio de la Santa Faz), on the outskirts of Alicante, in a chapel built in 1611 and decorated between 1677 and 1680 by the sculptor José Vilanova, the gilder Pere Joan Valero and the painter Juan Conchillos. The chapel is decorated with paintings depicting the miraculous termination of the drought, local personalities associated with the founding of the chapel and religious themes of judgment and salvation. The Monastery was extensively restored between 2003-6, together with the Cathedral of Saint Nicholas and the Basilica of St Mary in the city centre, and the three buildings housed an exhibition in 2006 about the relic under the name of The Face of Eternity. The cathedral of Jaén in Jaén, Southern Spain has a copy of the Veronica which probably dates from the fourteenth century and originates in Siena. It is kept in a shrine by the high altar and is annually exhibited to the people on Good Friday and on the Feast of the Assumption. It is known as the Santo Rostro and was acquired by Bishop Nicholas de Biedma in the fourteenth century. The Genoa Image, now in the Matilda chapel in the Vatican. This image is kept in the modest Church of St Bartholomew of The Armenians, Genoa, where it was given to the city’s fourteenth century Doge Leonardo Montaldo by the Byzantine Emperor John V Palaeologus. It has been the subject of a detailed 1969 study by Colette Dufour Bozzo, who dated the outer frame to the late fourteenth century, while the inner frame and the image itself are believed to have originated earlier. Bozzo found that the image was imprinted on a cloth that had been pasted onto a wooden board. The similarity of the image with the Veil of Veronica suggests a link between the two traditions. This image was kept in Rome’s church of S. Silvestro up to 1870 and is now kept in the Matilda chapel in the Vatican. It is housed in a Baroque frame donated by one Sister Dionora Chiarucci in 1623. The earliest evidence of its existence is 1517 when the nuns were forbidden to exhibit it to avoid competition with the Veronica. Like the Genoa image, it is painted on board and therefore is likely to be a copy. It was exhibited at Germany’s Expo 2000 in the pavilion of the Holy See. In 1999, Father Heinnrich Pfeiffer announced at a press conference in Rome that he had found the Veil in a church of the Capuchin monastery, in the small village of Manoppello, Italy, where it had been since 1660. Professor Pfeiffer had in fact been promoting this image for many years before. Professor Pfeiffer claims that the image is the Veronica itself, which he suggests was stolen from the Vatican during rebuilding that took place in 1506. He further suggests it is the cloth placed over Jesus' face in the tomb and the image was a by-product of the forces unleashed by the resurrection, forces he also believes formed the image on the Shroud of Turin. Additionally he has suggested a history of the veil going back to the first Century. 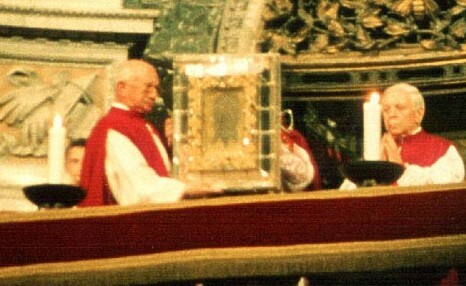 The cloth has received much publicity in recent years and Pope Benedict XVI visited the veil on September 1, 2006. The cloth is made of a rare fiber called byssus, which is linen woven from a fine, yellowish flax referred to as sea silk, and used by ancient Egyptians and Hebrews. According to Paul Badde, the Vatican Correspondent for Die Welt, this is a kind of fabric is usually only found in the graves of Egyptian pharaohs. Some feel that, despite claims of divine origins, the face on the veil at Manoppello conforms in appearance to the characteristics of a man-made image. Stylistically it is similar to images dating to the late Middle Ages or early renaissance; typical of representations of the human form from this period, it is naïvely-executed, with numerous stylized features, showing that the artist either did not understand, or did not wish to comply with the basic principles of proportion that apply to realistic renderings of the human form. Additionally, there is no evidence connecting the cloth with Rome. 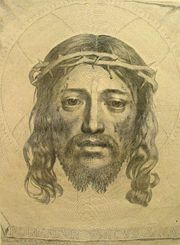 Indeed, it is far from certain that the face depicted has any connection with Jesus at all—one writer suggests that it is in fact a lost self portrait by artist Albrecht Dürer. A further objection, advanced by Ian Wilson, is that because the image does not bear a familial resemblance to known copies (see above), it cannot be the version of the Veronica that was venerated in the Middle Ages. Sudarium of Saint Veronica, engraving by Claude Mellan (1649), a famous virtuouso piece consisting of a single line beginning on the tip of Christ's nose. There are two main traditions for the iconography of the face depicted on the veil. One tradition (Type I), common in Italian art, shows the face of Christ as full-bearded, in pain, scourged and perhaps crowned with thorns. Another (Type II), common in Russian and Spanish art, shows Christ's face more often in repose, hair extending to shoulder length and a bifurcated beard, often surrounded by a halo quartered in a cross. Veronica's Veil Domenico Fetti, circa 1620. Holy Face Giambono, fifteenth century. Civic Museum, Pavia, Italy. Holy Face Held by Two Angels Juan Sánchez Cotan, 1620-1625. Monastery of Cartuja, Granada. Holy Face Domenikos Theotokopoulos (El Greco). Convent of Capuchin Nuns, Toledo. Veronica's Veil Francisco de Zurbarán, sevententh century. Parish Church of St Peter, Seville. Sudarium of Saint Veronica Claude Mellan, 1649. Diptych of Saint Veronica with Christ and the Virgin Mary Bernardo Martorelli, fifteenth century. Museum of Mallorca. Holy Face, anonymous, early 17th century. Tretyakov Gallery, Moscow. Holy Face Simon Ushakov, 1678. Tretyakov Gallery, Moscow. Miracle of the Tear Juan Conchillos, 1680. Lady Chapel of the Monastery of the Holy Face, Alicante. Miracle of the Three faces Juan de Miranda, 1767. Alicante Ayuntamiento. Saint Veronica Antonio Castillo Lastrucci, 1946. Basilica of St Mary, Alicante. ↑ 1.0 1.1 G. Schiller, Iconography of Christian Art, Vol. II (London: Lund Humphries, 1972), 78-9. ↑ Sacred Destinations, The Via Dolorosa—Jerusalem, Israel. Retrieved December 9, 2008. ↑ Jerusalem, Via Dolorosa. Retrieved December 9, 2008. ↑ New Advent, Catholic Encyclopedia: St. Veronica. Retrieved December 9, 2008. ↑ Ian Wilson, Holy Faces, Secret Places (New York, NY: Doubleday, 1991, ISBN 978-0385261050), 175. ↑ Neil MacGregor, Seeing Salvation: Images of Christ in Art (New Haven, CT: Yale University Press, 2000, ISBN 0563551119). ↑ Vincenzo Giovanni Ruello, Local Film Scientist Discovers Photograph Jesus Christ In Veronica Veil Inner West Courier (February 17, 2012). Retrieved June 29, 2012. ↑ Vision of Jesus Christ, Welcome. Retrieved December 31, 2008. ↑ Ian Wilson, Holy Faces, Secret Places, 157. ↑ Visitor's Guide to the Exposición La Luz de las Imagenes—La Faz de la Eternidad (Alicante, 2006). ↑ Ian Wilson, Holy Faces, Secret Places, 94. ↑ Phyllis Tortora and Robert Merkel (eds. ), Fairchild's Dictionary of Textiles, 82. ↑ Roberto Falcinelli, The Veil of Manoppello: Work of art or authentic relic? Retrieved December 31, 2008. ↑ Ian Wilson, Holy Faces, Secret Places, 161. Bennett, Janice. Sacred Blood, Sacred Image: The Sudarium of Oviedo, New Evidence for the Authenticity of the Shroud of Turin. ISBN 0970568207. Cruz, Joan Carroll. Miraculous Images of Our Lord. Tan Books & Publishers, 1997. ISBN 0895554968. Jensen, Robin M. Face to Face: Portraits of the Divine in Early Christianity. Augsburg Fortress Publishers, 2004. ISBN 0800636783. Kuryluk, Ewa. Veronica and Her Cloth: History, Symbolism, and Structure of a True Image. Blackwell Publishers, 1991. ISBN 0631178139. MacGregor, Neil. Seeing Salvation: Images of Christ in Art. Yale University Press, 2000. ISBN 0300084781. Schiller, G. Iconography of Christian Art, Vol. II. New York Graphic Society, 1972. ISBN 0821203657. Tortora, Phyllis G., and Robert S. Merkel (eds.). Fairchild's Dictionary of Textiles. Fairchild Publications, 1996. ISBN 978-0870057076. Wilson, Ian. Holy Faces, Secret Places. Corgi, 1991. ISBN 0552135909. History of "Veil of Veronica"
This page was last modified on 19 January 2016, at 21:06.